Closed cavities (interior cavities), open cavities (surface cavities), and shrink marks (Figures 1 to 5) are formations of macro cavities. Accordingly, the position of the cavities is logically such that surface cavities usually occur in the upper casting areas, which solidify last, in thick-walled casting areas, and near the downsprue and the gate. 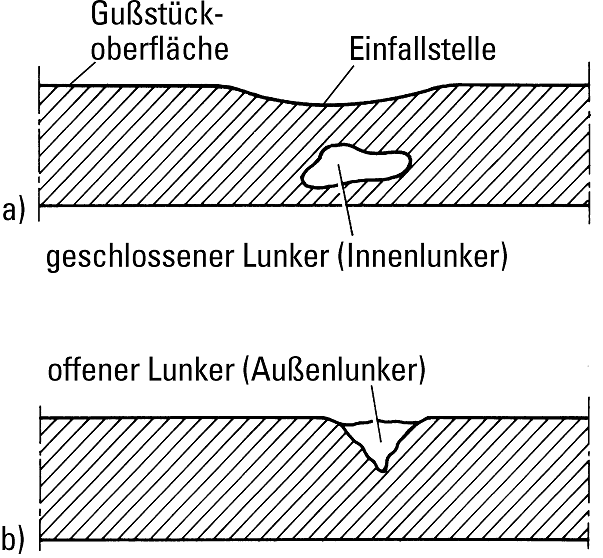 Interior cavities occur in particular in areas with greater wall thicknesses and at considerable wall thickness transitions, shrink marks preferably at cross-sectional transitions and at the outer surfaces of relatively thick-walled castings, often in connection with microporosity. Cavity formation occurs in all technical casting materials independent of the molding or casting process. However, pressure die casting offers possibilities to prevent or minimize cavity formation by building up a high final pressure immediately following mold filling. This does not prevent gas porosity. Materials having a low solidification interval and solidifying with a smooth surface, such as pure metals and eutectic or peritectic alloys, are particularly prone to macro cavities. Macro cavities (surface cavities) are deep, symmetrical voids, usually creating a funnel-shaped opening to the outside and extending into the inside as partly closed voids. The walls of these voids are generally rough and often dendritic. Surface cavities are clearly visible to the naked eye. Internal cavities have no connection to the outside and are therefore present on the inside of the casting with an irregular shape having rough walls which are often occupied by dendrites. They become visible to the naked eye through non-destructive testing or during machining at the latest. Shrink marks are trough-like depressions in the casting surface forming in the area of large material accumulations, the surface of the shrink mark not being different from the rest of the casting. 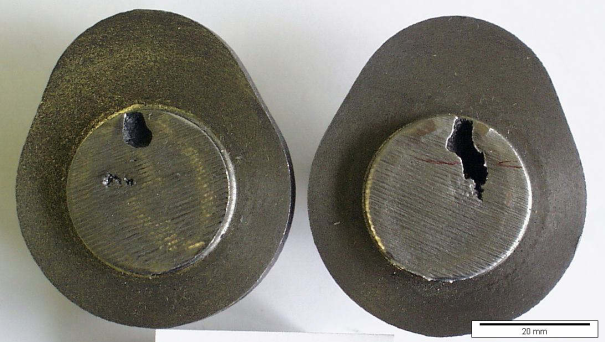 Shrink marks are also visible to the naked eye.If it is not possible to shift cavity formation to areas outside the casting by means of casting techniques (directional solidification, risering), this casting defect results in rejection. The specific volume of the common casting metals is higher in liquid state than in solid state. Therefore, these metals undergo contraction during solidification and cooling. This results in a volume deficit leading to defects such as cavities, shrink marks, microporosity, etc. (Fig. 6). Accordingly, cavity formation is the result of the interaction between the physical volume deficit created during solidification and the possibility of achieving compensation by means of post-feeding. The extent of the technical volume deficit in terms of specific volume primarily depends on the casting material. In relation to the overall volume deficit, its distribution within the casting and among the various types of volume defects mentioned is dependent on the solidification process. Specific influencing factors include the gas content of the alloy, mold wall movements during sand casting and graphite expansion during solification of cast iron alloys. The volume deficit in gray iron is characterized by differences in the specific volumes of individual structural components as listed in Table 1 below. During eutecticsolidification, the expansion of the diffused graphite diffused counteracts the solidification shrinkage of the austenite. For a specific graphite content, it is possible for the contraction caused during solidification to be compensated during formation of the austenite. This means that, depending on the chemical composition, the cooling conditions, and the balance of nuclei, “self-feeding” occurs. If large eutectic graphite quantities are diffused, the volume expansion caused by the formation of graphite may be even greater than the solidification contraction of the metallic phase so that on the whole an expansion occurs. Flake graphite cast iron shows a decrease in the tendency for cavities with an increasing degree of saturation up to the eutectic point. At the eutectic point, the volume deficit is the smallest. This applies to both the size of the surface cavities and the proportion of micro cavities. 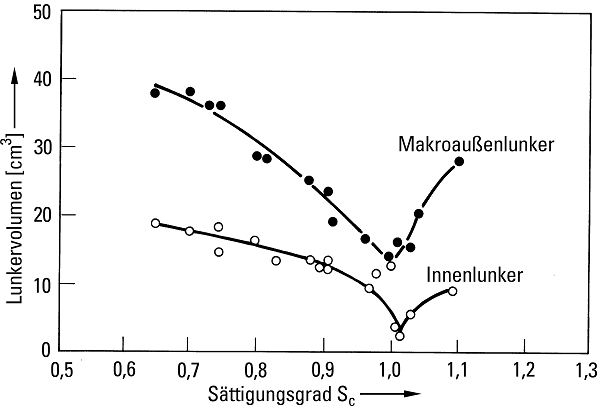 The tendency for cavities increases in the hypereutectic range(Fig. 7). For the same degree of saturation, the cavity volume to be expected decreases as the carbon content increases. Phosphor increases the tendency for formation of microporosity, mainly for P contents > 0.3% due to the formation of a phosphor-rich residual melt. Provided that non-inoculated iron would also have solidified gray, inoculation of flake graphite cast iron leads to an increase of the tendency for cavity porosity and shrink marks. 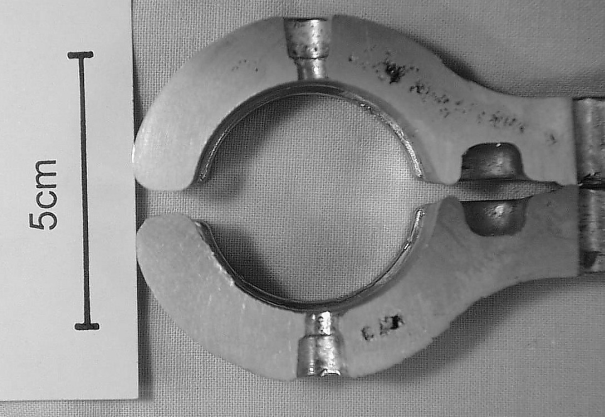 The “swelling” of the casting increases due to the increased expansion following strong eutectic graphite precipitation and the solidification type changes towards “mushy” solidification which results in the casting contour following the mold material-related mold cavity expansion more closely. Nodular graphite cast iron has a greater tendency for cavities than flake graphite cast iron. If a gray cast iron melt is treated with magnesium, the cavitiy volume increases from 0.5 to 5cm3. In contrast to the endogenic shell-forming solidification of flake graphite cast iron, the solidification of nodular graphite cast iron is endogenic mushy. In addition to the liquid contraction, which can be controlled by the riser and gating system, and a secondary shrinkage, an expansion occurs during the solidfication process. In view of the different solidification stages, the graphite may become active in the marginal shell during its precipitation and cause it to bulge or to expand if the shell and the mold material give in to this pressure from the inside. If the liquid metal subsiding in the casting body is not replenished, this alone may cause cavities. At a later point of solidification, the graphite diffuses in a larger area of the casting body. As the marginal shell may already be disappearing, the conditions for self-feeding become more favorable. If also the marginal shell still undergoes eutecticsolidification an increased expansion is to be expected. Subject to a strong mold, the utilization of this expansion phase results in a compensation of the secondary shrinkage and thus in cavity-free castings with high yields. Highly hypoeutectic and hypereutectic compositions, poor inoculation, excessively long casting times at excessively high temperatures as well as excessive magnesium contents promote the tendency for cavities in nodular graphite cast iron. Alloyed cast iron grades usually also show an increased tendency for cavities as is also the case with increased pig iron additions in the charge. However, the latter influence must always be considered in connection with the melting process. Here, too, the total volume deficit primarily depends on the alloy composition and the reference temperatures (cooling conditions) and its formation is controlled by the solidification process to a major extent. Decisive factors are the load capacity of the formed marginal shell and the feeding capacity, i.e. the conditions for the melt transport in the solidifying casting body. Departing from the pure substance, the surface cavity volume decreases to approximately the alloy with the greatest solidification temperature interval and then increases again as it approaches the eutectic. The volumes of shrink marks and microporosity are just the opposite. This fact corresponds to the change of the solidification process. With increasing copper, magnesium, and silicone additions the total cavity volume decreases compared to the aluminum itself, with the influence of silicone being the strongest The solidification shrinkage of Al-Cu and Al-Si alloys decreases as the Cu and Si contents increase. Cavity formation, however, significantly increases in the presence of contaminations such as iron(see iron needles). Surface cavities and shrink marks in aluminum alloys can also be caused by an incorrectly compacted sand mold or an excessively high die temperature in gravity die casting. As the total volume deficit can be between 2 and 7%, depending on the composition, measures for directional solidification and sufficient risering must always be implemented on the casting. Sodium and strontium modification results in a significant increase of the surface cavity proportion in both sand and gravity die casting, whereas shrink marks and internal cavities (microporosity) decrease. In real castings, the solidification process may change from exogenous to endogenous in certain cross-sectional areas. In this case, the effects overlap, the volume percentages of surface cavities and porosities are in the mid range. During modification it must be taken into account that the aluminum-silicone eutectic can occur in lamellar or in granular form, depending on the phosphor content. In gravity die casting, both modifications have approximately the same total volume deficit, whereas in sand casting the granular material is slightly below the lamellar. In both cases, the distribution of the volume deficit already changes when 0.02% of sodium are added. In the granular and lamellar material, the surface cavity volume increases and the shrink marks are reduced. After this, further sodium additions will have no considerable impact on the surface cavity volume. In gravity die casting, nearly no influence of the sodium can be found for the lamellar type. 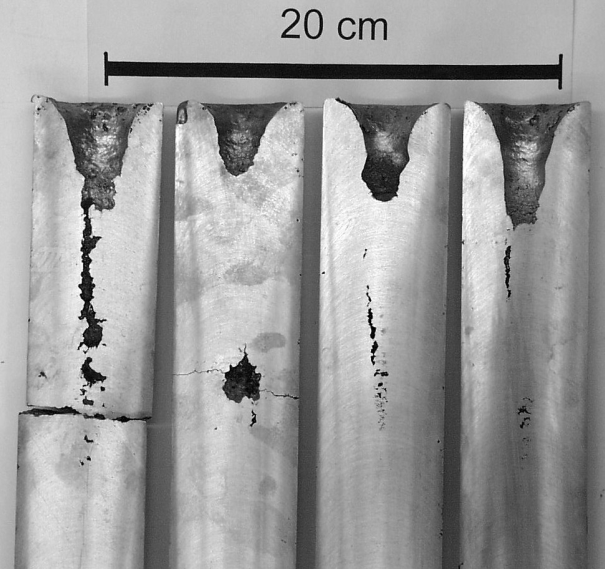 The granular alloy shows a significantly lower tendency for surface cavities. As the sodium addition increases, the surface cavity volume increases, and the shrink mark volume decreases. Moreover, the branching of the macro surface cavity increases in sand casting with increasing sodium addition. 1. Ensuring directional solidifcation from the casting section farthest from the downsprue to the place of last solidification, so that cavity formation is shifted to areas outside the casting or in the gate and riser system. 2. For casting materials with a low solidification interval, in particular eutectic alloys, consistent use of riser technology. 3. Calculation of risers (e.g. Heuver’s circle method) and use of methods for mold filling and solidification simulation. 4. Use of insulating and exothermic riser sleeves. 5. Increase of local heat dissipation by inserting internal chills or including cooling ribs or cooling coils (internal cooling). 6. Avoiding high differences in wall thickness and abrupt transitions from thick to thin cross-sectional areas. Radii, in particular, should be sufficiently large. 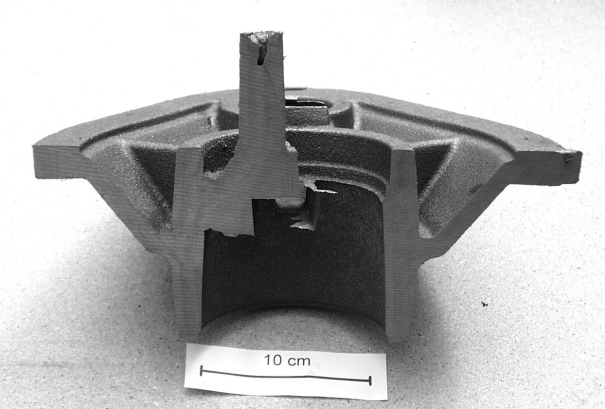 Solidification control should already be taken into account during casting design. 7. Reduction of the total volume deficit by reducing the casting temperature. 8. Changing the cooling rate by using mold materials with a good heat diffusion capacity. 9. If possible, the alloy composition must be changed in the direction of a lower total volume deficit. For cast iron, saturation degree 1 should be aimed at. 10 Use of sufficiently compacted molds; with nodular graphite cast iron, this could even mean that risering is not needed at all (pressure regulation method). 12. 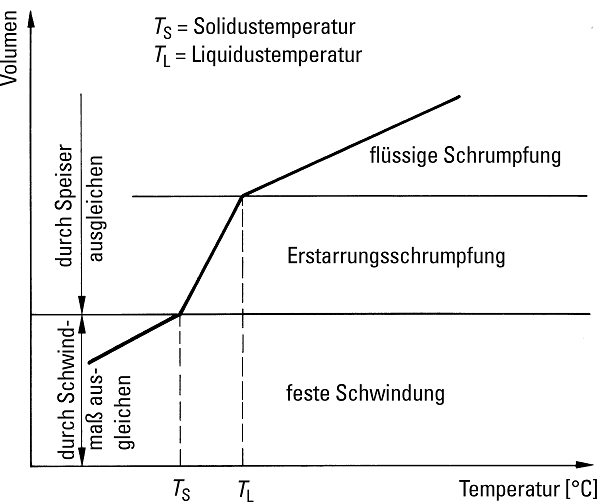 Observing the superheating temperature and time of the melt as they change the nucleation state and, thereby, solidification morphology. 13. Correct positioning and dimensioning of gates; they should be located where the hottest material is to flow through, i.e. where the mold cross section needs to be heated up. 14. Choosing large gates, so that melt can escape during expansion and then flow back into the casting during volume contraction. If possible, gates should be located at the top, ensuring short distances to the gates. 15. Aiming to obtain a high pressure head for post-feeding. 16. For aluminum alloys, the effectiveness of grain refinement and modification needs to be verified; the use of another alloy, e.g. AlCu alloys, can also be helpful. 17. Reducing the gravity die temperature, the same applies to the mold temperature in pressure die casting.